The Information screen displays a summary of your notebook hardware information. Shows the CPU type and speed. Shows the model name of the Hard Disk Drive (HDD) installed on the primary IDE master. Shows the serial number of the HDD installed on the primary IDE master. Shows the model name of the HDD installed on the secondary IDE master. Shows the serial number of the HDD installed on the secondary IDE master. Shows the model name of the optical device installed in the notebook. 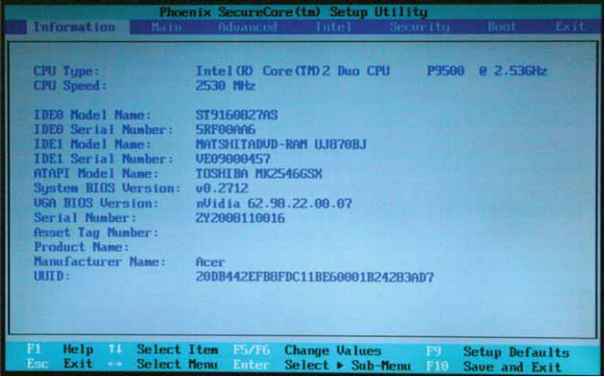 Shows the version of the system BIOS. Shows the VGA firmware version of the system. Shows the notebook's serial number. Shows the notebook's asset tag number. Shows the notebook's product name. Shows the notebook's Universally Unique Identifier number. The UUID is an identifier standard used in software construction. It is standardized by the Open Software Foundation (OSF) as part of the Distributed Computing Environment (DCE).